This is a rectangular Shiner Beer porcelain sign. This particular Shiner Beer sign is predominantly blue with yellow and white print. 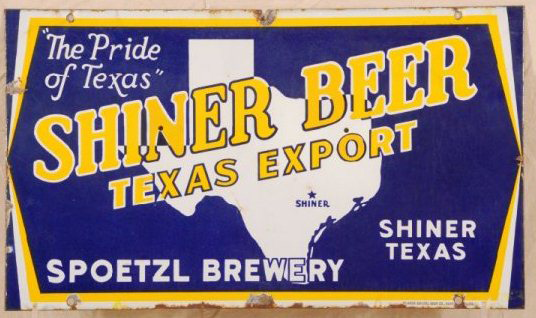 It reads, “Shiner Beer, Texas Export, The Pride of Texas, Shiner Texas, Spoetzl Brewery” and features a white outline of Texas in the center of the sign.